Lechon Kawali or Roast Pork is a popular Filipino pork dish. 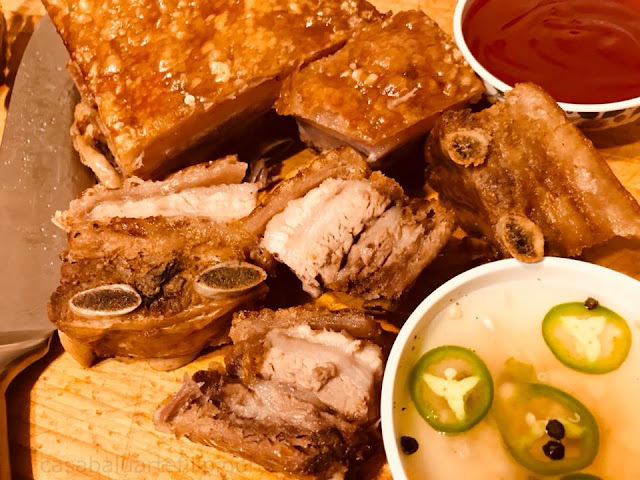 Made with pork belly simmered in seasoning and deep fried until crisp. 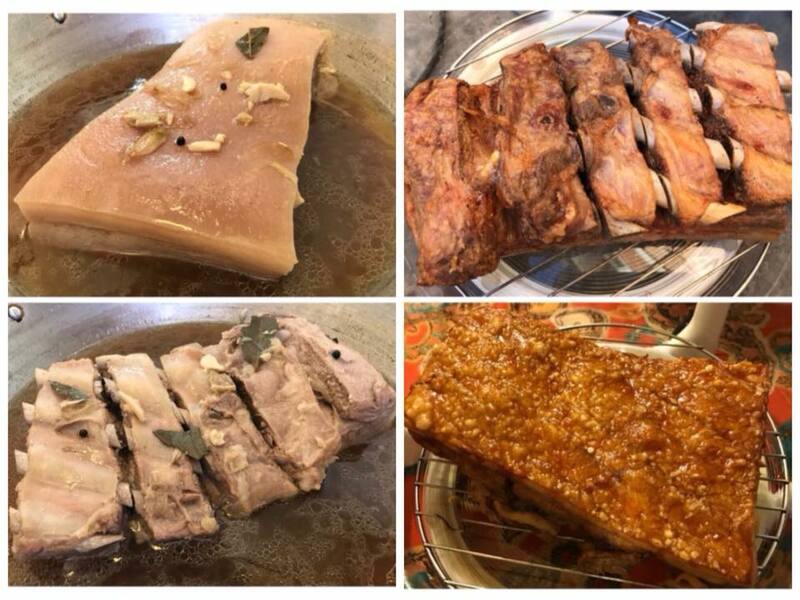 There are several options in cooking Lechon like Deep Fried Lechon Kawali or Oven Lechon or using a turbo broiler. With this recipe I used my dependable turbo broiler and it sure worked like magic. This dish has the same crisp and flavor as Lechon Kawali deep fried, but less greasy. Turbo Broiler is a portable convention oven and easy way to prepare meat. The hot air melts the fatty parts of the meat, leaving it tender and juicy with no cooking oil needed. Put pork belly in a wok or a big pot and add enough water to cover. Add in salt, soy sauce, garlic, peppercorns, bay leaves and bring into a boil for about an hour or until meat is tender but not falling apart. Once the meat is done, remove and drain excess water. Allow to cool for few hours at least before broiling. Preheat turbo broiler at 200 temp for at least 10 minutes. Put in meat skin down and broil for 30-45 minutes at 350 temp. Turn the meat skin up and broil for another 30 minutes or until skin is red and crunchy. Remove meat from broiler and allow to rest for at least 5 minutes before chopping. Serve with your favorite dipping sauce like Mang Tomas or spicy vinegar or ketchup and lots of rice. Enjoy! 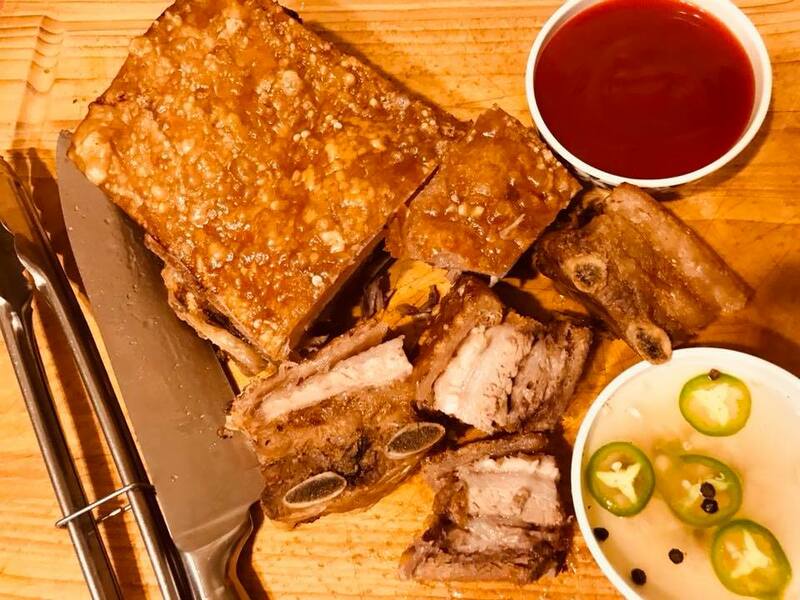 When using bone-in pork belly, ask the butcher kindly to partially cut through the bones so you can easily chop into pieces once fried. Do not over boil the meat or else the meat will fall apart. When broiling make sure not to overcook because the meat will turn out dry.